Joy, the founder and CEO of Suicide Crisis, has been named as one of the “fifty greatest Gloucestershire women of all time” by our local newspapers in the county. Dame Janet Trotter, the Lord Lieutenant of Gloucestershire, worked with our local newspapers to decide on the list. She was also named as one of the “hundred most influential women in the West” by the Mirror group newspapers (Trinity Mirror). “We never set out to achieve zero suicide. We simply set out to do everything that we could for each individual to help them survive”. Joy was invited to a meeting of the All-Party Parliamentary Group on suicide and self-harm in the House of Lords in December. This month she has been invited to provide a further submission for the Health Select Committee inquiry into suicide prevention, following on from the oral evidence she gave in parliament last year about our Suicide Crisis Centre. This time she has been asked to comment on the Government’s updated strategy on suicide prevention. Joy has also been invited by the Government’s adviser on suicide to meet with Health Select Committee Chair, Sarah Wollaston, in early February. The BBC 6 o clock news featured the work of our charity on 29th November. A news crew filmed us as we went out to visit clients in their homes. As well as providing a Suicide Crisis Centre where clients come to see us, we also need to provide home visits, particularly when clients are at imminent risk of suicide. Joy was invited to give oral evidence to the Parliamentary Health Select Committee on the 8th November. 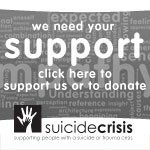 They are undertaking an inquiry into the action needed to help prevent suicide. Joy was asked to speak to the Select Committee about our Suicide Crisis Centre and how it works. The Government’s adviser on suicide, Louis Appleby, approached us a few weeks ago to ask us to give a presentation about our work to the National Suicide Prevention Strategy Advisory Group, which he chairs. We did so on Tuesday. We explained about our ethos and approach, the way our services run, how we have achieved zero suicide at our Crisis Centre, and why a high proportion of our clients are men.